Welcome to the waterpark! Antediluvian pastimes are over. 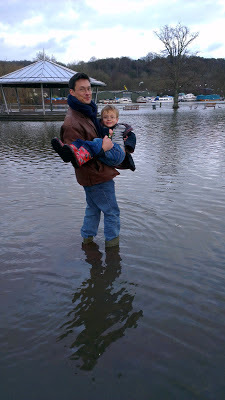 In the era of the flood, there is a new attraction in Henley-on-Thames. Throw on a pair of wellingtons and come on in. The water's lovely! This year is the wettest on record for England since records began in 1910. No wonder we are obsessed with the weather. Anyone fancy a pint? Of river water? In amongst the mobile ringtones and the ping of my computer, there is a new sound in our house: the shuffle of a letterbox opening and the plippety-plop of many envelopes falling to the floor. Where once I might have left the bank statements languishing on the doormat for days, now I pounce upon the Christmas cards with relish. There is something satisfying about those handwritten envelopes and the promise of what lies within: news, photos and tidbits about a life on the other side of the world. Christmas is many things, but in my mind it has become a time to consolidate friendships. Facebook does a good job of tending the outer circle, but Christmas cards can reach beyond that network to aunts and uncles, childhood chums and even old work colleagues. The sort of people you rarely see anymore, but still like to hear from. The memories I share with these acquaintances make up the patchwork of my past. Our interaction is proof of another self that I inhabited years ago - now evolved but not quite shed. Each snippet of news also reminds me of how life plods on outside my narrow sphere - children grow up, marriages are made and broken, loved ones pass away. Robert Burns expressed something of this in his poem about remembering long-standing friendships. As one year ends and another begins, it has become a tradition to take stock of the communities that surround us. In this age of efficiency, Christmas cards have also managed to outlast the grasping tendrils of technology. The joy of slow communication has seen a resurgence recently, and aside from a few typed newsletters, cards still bear a written hand and travel the old-fashioned way. 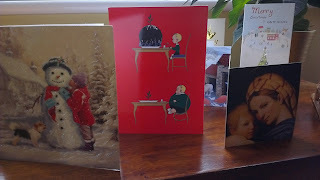 Admittedly they are arduous to write, but cards received bring a tangible token of friendship onto our thresholds. It is that time of year again. 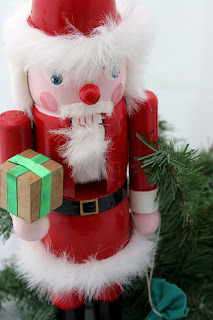 I work myself to a standstill and then some old guy in a red suit takes all the credit. Worse still, I am complicit in perpetuating the lie. Thanks to my dishonesty, my son fervently believes Santa is up there with the superheroes. I hate to bring feminism into this, but how can we ever achieve equality between the sexes when women bear the brunt of Operation Christmas? Phew! And that's on top of normal life and all the other grey, nameless chores women accomplish in a working week. We are the unsung heroes of Christmas logistics. Still, there is something contagious about the excitement building in our house. Letters to Santa are being penned and theories on how he manages to get round all of those homes in one night are being expounded. For the little people, Christmas is stupendous - a heady mix of magic, wakefulness and wish-fulfillment. I am not so jaundiced that I can't remember the heart-thumping thrill of Christmas Eve. I just wish we stayed a little closer to the truth and called our festive superhero 'Mother Christmas'. Maybe kids would even believe in her existence for a little longer. Because let's face it - only a woman could juggle that many baubles and get home to cook the turkey. Imagine the scenario for a moment. A Russian aristocratic woman meets with a life coach. Note that the light has been extinguished from her grey eyes. Coach: Hello - thanks for coming. What brings you to coaching? AK: I have no cause for joy. Laughter jars on me painfully. Coach: What is it you would like to achieve from this session? AK: I need to escape from my troubles. I am conscious of my own humiliation. Coach: If you were to tell me a story about yourself, what would it be? Where to begin? Earlier this week I attended a discussion on the philosophy of personality, organised by a life coach as part of his training. In an hour and a half, we covered nurture versus nature, identity versus behaviour, the plasticity of the brain and our need for reflection. There were about a dozen people present and almost as many views on the formation of personality. Did Anna Karenina need a life coach? The basic premise of the discussion, however, was that human beings have an innate desire to self-improve. Life coaching exists as a form of counselling to help us to realise our potential and, if necessary, change direction. Since civilisation began, human beings have used all sorts of practices - religion, exercise, drugs, education and even surgery - to enhance their attributes and abilities. Life coaching joins that list. So what has Anna Karenina got to do with all this? Self-improvement, or character development, is also the engine that drives most novels. All those great protagonists - Pip of Great Expectations, Jane Austen's Emma, Madame Bovary - set off on a journey to self-discovery, or ultimate self-destruction, depending on their fate. The news sites Ibiza Spotlight and The Ibiza Sun have both marked the launch of my new novel, A Sister for Margot. The island of Ibiza figures largely in the book and I spent a significant chunk of my childhood there so I am delighted that these sites have decided to cover its publication. An article is scheduled to run in the paper version of The Ibiza Sun next week. As you may know from a previous post, I whiled away many an afternoon writing the book on the terrace of my grandmother's villa in Port des Torrent. I hope that my proximity to the subject has made the passages set in Ibiza that much more sensuous! One of my main characters, the orphan Ruby, is brought up in the expatriate community of Ibiza and she thrives under the influence of her grandfather's eccentric friends. The book attempts to portray the youthful, hedonistic side of Ibizan life, as well as the retired artists, diplomats and services personnel who have made the island their home. Ibiza Spotlight, which launched online in 1999, is a source of news, information and services about Ibiza. The Ibiza Sun is an independent, free newspaper and website. Welcome to my blog! I am a mum, a former BBC journalist and an author of romantic novels. Generally, there is a bookish theme to my posts, but I also blog about family life, feminism, travel and anything that piques my curiosity. Find An Author's Notebook on Facebook and Pinterest. See my website for more details. Can Clegg save us from Brexit?